Home News First Trax Best Friday to date, Hands Down! Best Friday to date, Hands Down! With the pending winter storm (and excitement) on the horizon, today is actually the best Friday to date. Remember, just last Friday was “Meh . . .” with warm temps and heavy rain. The marked improvement from just a week ago is palpable. Let’s look at the impacts of the upcoming Storm. The models are still holding pretty solid throughout the region. The latest updates might have shaved off a little in terms of the snowfall amounts, but not by much. The moisture content is still off the charts . . . And I think this is going to be a storm for the ages. It’s at the point where all three models are starting to get aligned and with less drastic discrepancies. I would say in order of snowfall amounts, the Euro Model is high (probably unrealistic amounts of snowfall in the 22″ to 24″ range) I just think that the storm is going to move through too quickly to dump that much snow. The GFS model is slightly over-pocketed (with large regional variations). I.E. Mars Hill only getting 3 to 5″ while Brevard/Hendersonville receive 17″ . . . hmmm, seems suspect. Finally, the NAM model is probably the most realistic with somewhere in the 9 to 11″ range, near the Asheville area. Jim Cantore to make an appearance!?!? The headline says it all . . . You gotta love good ‘ole Jim for better or worse. Maybe I can finally get that autograph. 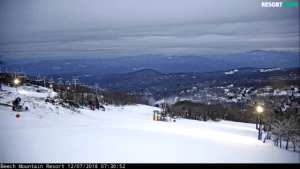 Appalachian Ski Mountain: Holds real steady with 9 trails open. Their grooming is getting really dialed-in this year. Let’s all get some fresh corduroy, before multi-day powder sessions. 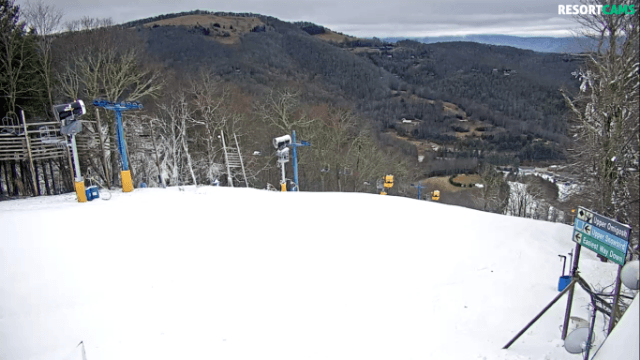 Cataloochee: Gets a big boost today with a doubling of their trail count 12 trails open today (up from 6 yesterday). They definitely get the most improved award from 24 hours ago. Snowshoe: Has some wonderful plans in place for the intermediate/advanced skier/rider over the next couple of days. Lower Ballhooter opens today which bumps their trail count to 21. Tomorrow, Widowmaker joins the party of trails. Sunday (hopefully) brings the addition of Cupp Run and Upper Shay’s Revenge! Beginners get to join in on the fun too. Sunday every WV state resident receives a free lift ticket and a beginner lesson . . . what a package. 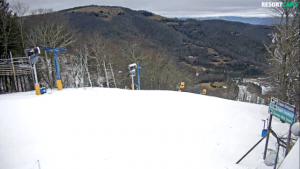 Beech Mountain: is operating with 6 trails open today. Tomorrow brings back the RECklESS Rail Jam . . . https://www.beechmountainresort.com/event/reckless-rail-jam-presented-recess/ . Next week, we will post the top 3 placings and give them a shout-out on FirstTrax. Two resorts have special sessions today . . .
Wintergreen: Fires up the lifts today with a special session for Season Pass Holders and Members from Noon to 5pm. They drop the ropes tomorrow for regular day sessions. 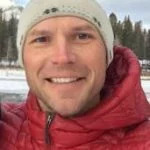 Massanutten: Debuts their season today with a similar session. 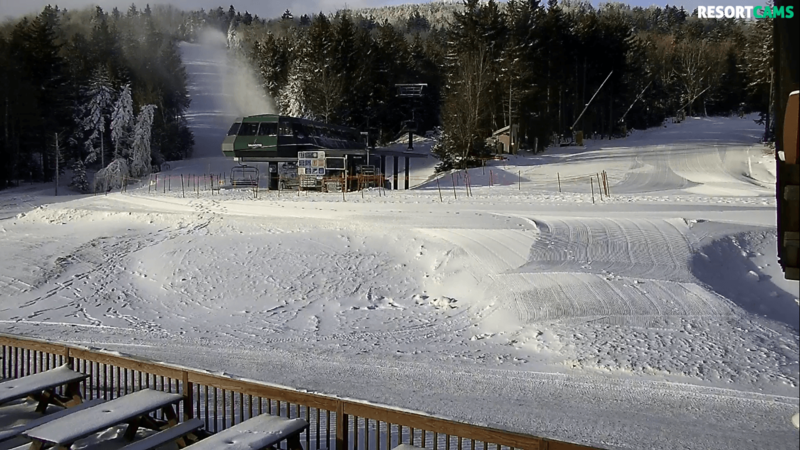 From 12pm to 4pm Season Pass Holders get a first look at 2 trails with 2 lifts operating. Tomorrow they hope to have lift #5 open to mid-station, which begins their assault on the regular season. That Wolf Ridge is on the verge of opening. Stay tuned for more details. 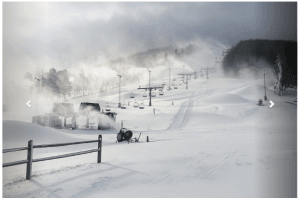 Previous articleSnowmaking was ON last night!